In the evening of 25th February 2010, at XIMB auditorium, dance enthusiasts of Bhubaneshwar gathered with much anticipation for a performance by the one and only Ramli Ibrahim and his group. 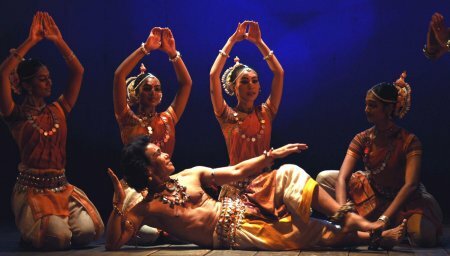 The name Ramli Ibrahim is synonymous with his Malaysia based Sutra Dance Theatre which has never failed in providing surprising, thought-provoking and often exciting Odissi dance recitals. Ramli Ibrahim himself is also synonymous with the invariable production of "a strong original repertoire." 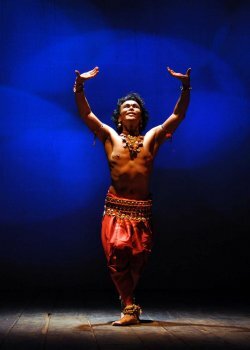 An imaginative, sensitive and accomplished dancer himself, Ramli always attempts to break new ground in Odissi and this particular programme named "Spellbound" obviously had the same objective. In his inaugural speech Lalit Verma, the President (Aurodhan Les Galleries de Pondicherry) a co-sponsor of the show along with Indian Council for Cultural Relations, spoke eloquently about Ramli being an ambassador of Odissi dance. Much with the same spirit that medieval seafarers from Orissa sailed to Sumatra, Java and Bali (celebrated today as 'Balijatra') carrying the produce of Orissa to distant lands, Ramli has successfully conveyed the traditional music and dance of Orissa to many places around the globe. Lalit Verma welcomed the audience to this 'Bhubaneshwar Jatra' of Ramli. Eminent dance critic Sunil Kothari was effusive in his praise of Ramli's dedication, knowledge, vision and most importantly, his endearing humility. He also spoke movingly of his own valuable interactions over many decades with the celebrated Gurus Pankaj Charan Das, Kelucharan Mohapatra, Debaprasad Das and Mayadhar Rout. He specially recalled his visits to numerous Orissa temples in the learned company of Guru Kelucharan Mohapatra as an invaluable learning experience. Meenakshi Mishra, the head of the Orissa Chapter of ICCR, delivered the vote of thanks. The nice atmosphere created by these eloquent sentiments was however marred by the very inappropriate style and language of the compere who was supposed to introduce the actual programme. His disc-jockey style of delivery and his generous sprinkling of words like 'extravaganza' made it appear that he was anchoring a Rock show instead of introducing a traditional classical dance recital. Organisers need to be careful of their choice of the compere – the wrong type cheerfully sinks the aesthetic ambience in an ocean of inanities and hyperbole. Then began "Spellbound," billed as "A tryst with the timeless beauty of Odissi…" and consisting of five Odissi compositions originally choreographed by Guru Durga Charan Ranbir, rearranged into group compositions by Ramli. The five items were 'Mangalacharan - Saraswati Vandana', 'Mukhari Pallavi', 'Ashta Shambhu', 'Oriya abhinaya - Kadamba bane banshi' and 'Aditya Archana.' The presentation of all the items was good and in parts, even arresting, as expected of Sutra Dance Theatre. The female dancers were notably good - their grace and sureness speaks well of their abilities as solo dancers too. For me this was heartening. The only slightly odd feature that stood out was the lower limb movements of the male dancers. Their legs moved with a degree of effeminacy, as also the exaggerated feminine swaying of the hips - beyond a degree this becomes uncalled for in a male dancer. Ramli's dancing was obviously outstanding; his rich experience and aesthetic sense brought out an inner ecstasy, the joy in the persona of the dancer that is so fulfilling. In comparison, Guna - the other male dancer - gave a rather dull display. The power and depth which Guna is capable of and has demonstrated previously, was missing here, inexplicably. The overall synchronisation in respect of total group, left something to be desired. Specially, the arm movements were lacking in symmetry on a number of occasions. Also, after a brisk movement, the sudden coming to a stop with one leg raised, showed a shaky lack of practice. By Sutra's own high standards these were avoidable flaws. In a choreographer's experience, such flaws creep in when there is a periodical influx of new members performing along with more experienced dancers. This is a familiar burden for any choreographer and very considerable efforts to overcome this must be made by the Guru, specially when rendering an important stage performance. Since I, as a choreographer, have faced this problem a few times, my sympathies lie wholeheartedly with Ramli. An added issue for me was the execution of the 'Mukahri Pallavi,' specifically Guna's role in it. The character that Guna represented could not be communicated to the audience; it certainly left me confused and in spite of a plethora of movements and poses by this dancer, the message just did not get across. A misfortune, specially when the lucidity of a choreograph fails to fulfill its function! 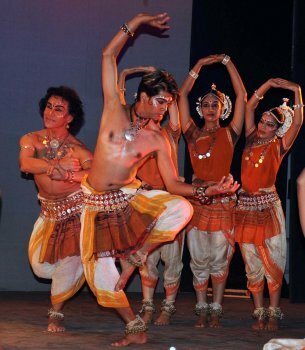 It is also clear that Odissi, derived from one of the most ancient forms of Indian dance, has a vast grammar. It does not need to be embellished by ballet movements to heighten its aesthetic appeal. A word about costume. In my view there ought to be some symmetry of costume in a group dance and it was refreshing to see that Ramli's group was not using the stitched costume which has become the norm! However, the absence of the 'Taitha' (Armlet) was glaring; this particular ornament adds much grace and appeal to the feminine form and I am wondering why the female dancers chose to do away with it! Similarly the necklaces worn by Ramli and Guna were visibly different and it appeared to be an unnecessary asymmetry in traditional adornment. An attempt at some uniformity in costume and jewellery heightens the appeal of a group dance or for that matter, any visual art involving the human form and movement. The female dancers were Shivagamavalli, Geethika Sree, Michelle Chang, Abiramavalli, Thrisherna, Jyotsna and Shobhna Kumari Bag. Special mention must be made of Sivagamavalli and Geethika Sree, who were easily a cut above the rest. Much can be expected of them in future since they are already adept in all aspects of the dance. All the five items of "Spellbound" were danced to live music. By and large the music production by the senior artistes was good: the sustained notes played by the flautist and sitarist were out of key and at these junctures sounded a little unpleasant to the ears. Mardala playing by Guru Dhaneswar Swain was of an exceptionally high order. Towards the end of the item "Aditya Archana" he demonstrated absolute virtuosity specially in the long passages featuring the 'bol' "Dhane dhetete ta Tane dhetete ta." Fluent, flawless and very impressive, since sustained playing of a 'bol' for an extended time is always very difficult on the Mardala. The musicians were Guru Dhaneswar Swain on Mardala, Sukanta Kumar Kundu on vocals, Abhiram Nanda on flute, Swapneswar Chakraborty on sitar. Ramli's Guru Durga Charan Ranbir conducted the recital and played the Manjira. Light design by Shivarajah Natarajan was excellent and fully augmented the dancers' efforts. Here I would like to make a slight departure from the norm, as far as reviews go. A word about the publicity. Sutra has produced a colour brochure for the "Spellbound" presentation. While the general get-up and graphics of the brochure were eye catching, there were careless errors in the spelling. Established was spelt as ebtablished, Creative principle as Creative principal and Aditya Archana as Aditya Acharna! Quite an avoidable cluster of mistakes, Ramli the perfectionist will agree, if one includes a brochure in the total aesthetic experience of dance/art! Ramli Ibrahim has done commendable service to Odissi classical dance and its spread in South East Asia and many parts of the world. 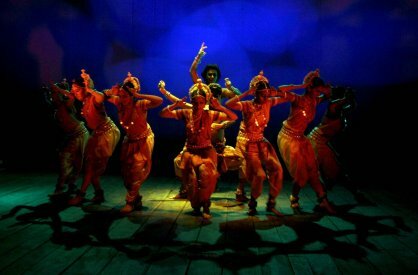 His fascination with Odissi has added a touch of exactitude to his inspired performances and thought provoking choreography. The future beckons with even greater promise, and I extend profound good wishes to him on the journeys ahead.